To recognize and celebrate an important historical moment of an OWS affiliate, the Russians, as they continue their struggle for a better life in the face of corruption and oppression. To inspire OWS with a philosophical understanding that the status quo sometimes ends as portrayed by the photo above. 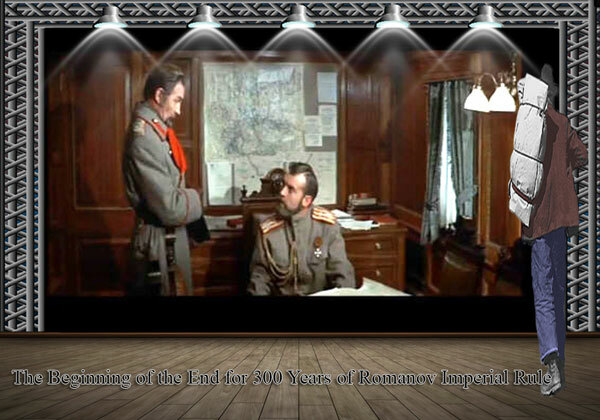 The photo above was captured from the movie Nicholas and Alexandra, which was a screen version of the book by the same title. The importance of this particular photo is that it captures the very moment when Nicholas II first learns of the eventual demise of his reign; that is, he learns that his palace has been commandeered by the revolutionaries. Nicholas attempts dispatch a message that his generals should quell the uprising when he learns from the staff officer in the photo that many of his generals have defected to the revolutionaries. The expression on Nicholas's face is one of utterly disbelief. Thus, Czar Nicholas is learning for the first time that the Romanov's imperial rule over Russia, reigning from 1613 until 1917, is coming to an end, albeit he does not fully accept this fate just yet. It can happen here, too...again. So, don't just read history, make it! We all know that the following rule was as corrupt if not more and destroyed millions of lives. Not saying that imperial rule had desired results. Just saying that change for the sake of change is of little value. Clear vision of what you want the change to be is of utmost importance. So, we overthrow the existing condition. Replace the ensuing vacuum with what? IF, it has no value, we are destine to be in a possible worse condition than we are now. But when a long train of abuses and usurpations, pursuing invariably the same Object evinces a design to reduce them under absolute Despotism, it is their right, it is their duty (a), to throw off such Government, and to provide new Guards for their future security. (a) In my opinion, within the system, which, I maintain can be achieve by proposing modifications to the Constitution; for example, the implementation of a plural executive to supplant the current unitary one. We all know that the following rule was as corrupt if not more and destroyed millions of lives. Not saying that imperial rule had desired results. Just saying that change for the sake of change is of little value. Clear vision of what you want the change to be is of utmost importance. So, we overthrow the existing condition. Replace the ensuing vacuum with what? IF, it has no value, we are destine to be in a possible worse condition than we are now. For me the way to throw off is prescribed in the 1st Amendment. The Declaration is doing it by the book, using the tools the Founding Fathers wisely provided. But people need to pick the tool up if they really want to fix anything. BTW I never heard back from your last photo. Was it Paul Revere? Nice analogy that could only come from the wisdom of a farmer. The photo comes from the digital Library of Congress and the man in the photo is a migrant worker on his way to California, presumably from the dust bowl area, although the LOC does not mention so. If you go back to the original posting here http://occupywallst.org/forum/salute-to-ows/ you can see the original photo that I have added. I love photos of this era and have a few more here: http://www.flickr.com/photos/24595374@N05/sets/72157628502953175/. All are clean-ups with added embellishments from the digital LOC. I cannot close without asking what it is like to be a farmer in 21st century. I have a great appreciation of your profession which spawns from grandfather, who owned and operated a mule-driven grist mill in 1950's.